Laura Wilkes has everything a woman could want when she snaps the picture of her five-year-old daughter on the carousel. Each time the carousel comes around Laura snaps another picture, seven in all. This is a day of unforgettable happiness; one of the few Laura has left. Sometimes when I read a book I have a question in my mind. 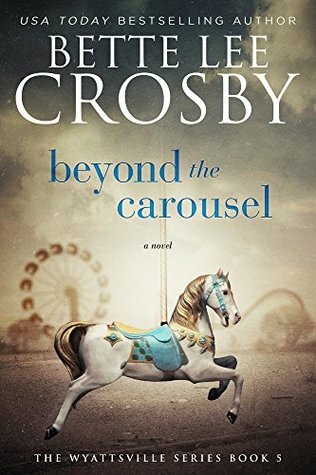 And especially with Beyond the Carousel by Bette Lee Crosby. It was about the title - why was it given this title? What did it have to do with the book? Well as it turns out it was a good question to hold and I was fully answered as I read a long. I actually had a second question, how is this one related to one or more of the other books I've read in this series. It has been awhile so I wasn't sure if my memory would help - but enter - one memorable and loved detective met in book one, Jack - Spare Change. This is a story that ranges over time from the early twentieth century, through the Depression times and on past the war. It is the story of a few generations of family, the joys and sorrows that befell them and the way they handled it. Emory is a character who is in the story right through. He comes into some good fortune early on and it makes all the difference to his life and those around him. I liked him, he was loving and caring, hardworking and positive. He didn't always get some things right immediately, but by listening to the women in his life, his were ultimately good choices. When he finally retires and for awhile loses his purpose in life it isn't long before there are people and things to do that bring new meaning into his life. Then there are the women in Emory's life who bring him so much joy, they are wonderful homemakers on the whole and add very much to the story, as does the homes they live in. It is left to Jack Mahoney to round off this enjoyable story. This is him before we met him in Spare Change, his beginnings as a police officer where he met his wife all through some eggs, and an arrest. In this book too we see his dedication and fight for justice, as he manages to close a cold case. While a little predictable and with not as much tension as in previous novels in this series, I certainly enjoyed the story and the family as they travelled through that first half of the twentieth century. It's a pity it's predictable but apart from that it sounds good. I like the historical fiction/crime mix up. I was thinking on different angles but the historical fiction/crime element and I hope eventual solving of the crime helps the story. I have been meaning to read this author. I am now curious about the connection to the carousel. This sounds so different from the usual historical fiction and at first I wasn't sure about it based on the blurb. However, after reading your thoughts I really want to try it. I need to get a copy of Spare Change as well. Wow what a premise, Thanks Kathryn! I will definitely be picking this book up soon! I haven't read many books set during the Great Depression, so I'm very excited to try this one! Such an interesting cover. I do like finding out the whys to a title especially if it really fits the book.